The Physics Department and the Board of Management of the TUM have signed an agreement on "Diversity", which includes a total of three dimensions. Scientists at the Physics Department working together. Foto: TUM. 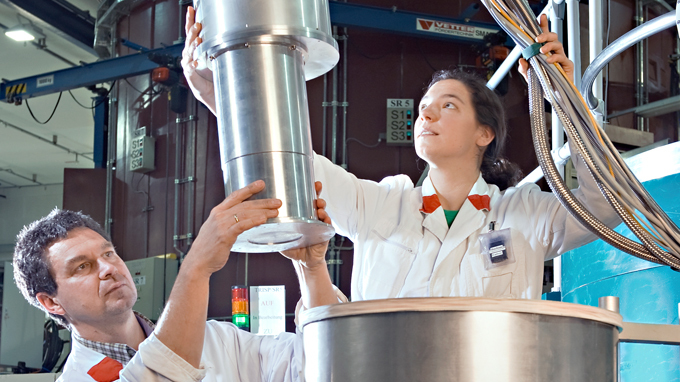 The Physics Department and the Technische Universität München signed an agreement on “Diversity“ on February 1, 2013. It is divided into three dimensions of diversity. The percentage of female students at the Physics Department is below average. Incentives for female students to study physics at TUM should be offered at the time of the admission to the Bachelor's or Master's degree programs. There is a pool of student/research assistant jobs for female students. The duration and further details are determined on a case-to-case basis. Increasing the number of female Master's students, should on the long term also increase the number of female doctoral candidates. The funds are provided by the Physics Department and the Universe Cluster also offers additional funds. With the new tenure-track system of TUM, the access for highly qualified young female candidates to an assistant professorship (W2), with chances for a permanent professorship (associate professor, W3), should be made possible. However, it is also necessary to support promising female doctoral candidates and postdocs with their own position or to offer them a bridging fund option to allow the development of their ideas and ongoing projects to be finished. A female postdoc supported by this action was lately appointed as a professor by another university -- what we consider a success for this action. The Physics Department offers resources for these projects. More about these actions under gender equality. Parent-child room allow parents to work while having their children around. Given that this action is very popular, these rooms shall be integrated to the Physics Department during its renovation. The option of early maternity-protection assistants should be communicated and offered, as there is a number of experiments that cannot be run by female scientists during their pregnancy. Request for reduction of the teaching hours of the Equal Opportunities Officer by two hours, due to the number of tasks. The Equal Opportunities Officer has a budget at her/his disposal, which can be raised due the expenses upon consultation with the Dean of the faculty. Financing a student/research assistant to support the Equal Opportunities Officer. Further coordinated Master exchange programs by 2014. In a "direct track", achievements done during the Master's thesis can flow in a coordinated way into the doctoral phase and the Master's thesis act as a “pre-thesis”. In case the candidate does not manage successfully through this way, he or she is still able to finish the Master's degree program and move later on to an independent doctoral project, which might probably require a longer period. The Department Graduate Center (DGC) should prepare an interlinking of the Master and doctoral studies. The option to the "direct track" is an international elite program of the DGC, which shall include modules and be finished with a certificate. It is a symbiotic approach, embedding the German education system into an international context and making it more competitive. In terms of internationalization, this refers in particular to the widespreaded Anglo-Saxon approach. A pool of contracts for student/research assistants shall be setup with resources of the DGC. In the style of a scholarship, these contracts shall in particular be offered to excellent international students. Agreement of the Physics Department on "Diversity" (PDF file, in German). The following pages provide information on TUM's programs and measures to support its scientists and scholars, students and employees in their various life circumstances, as well as to research and promote awareness in questions of diversity.